That’s 8,760 cpm Counts on each city listed in a year; 8,784 cpm count reports in a Leap Year. The increase in Gamma radiation in the States this week, August 11, 2018, to August 18, 2018, was a high 78,215,704 cpm. 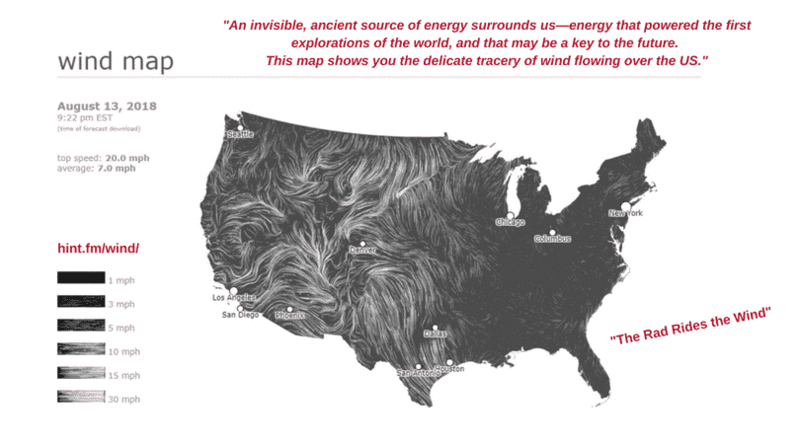 The Total Gamma Rad 2018 Annual Projection is just over 4.07 Billion Gamma Rad for the US. The Rad measured YTD in 2014 was 2,570,046,592 cpm. “This is a Bad situation for all who breathe,” states EU physicist Dr. Paolo Scampa. Now included, for the 32nd Week of 2018 just passed, all cities above 32 Million CPM  Year to Date [YTD] of deadly Gamma Radiation. SHOWSTOPPERToday’s 230-day or 5,520-hour report for January 1, 2018 to August 18, 2018, is another case of Bad news from your radWeather Report. 63.10% [to August 18] of 2018 is gone. Within minutes or hours of publishing this list of cities over 32 Million YTD Counts of Radiation, four more cities will Zoom past 32 Million Counts of deadly Gamma Radiation since January 1, 2018. 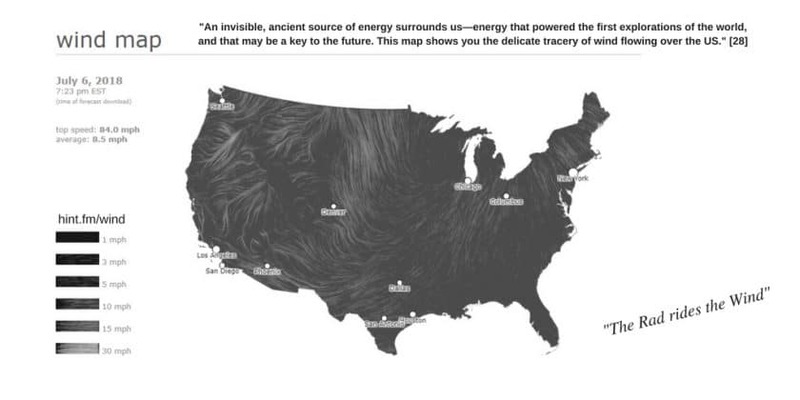 Today there are 1,946 known radioactive Isotopes in existence in our atmosphere. The known Gamma radioactive Isotopes are measured and reported here. Cell assassins, like Plutonium 239, and its brothers were never around; they did not exist. That will be 27 cities above 32 Million Rad Counts so far this year. 2018 Annualized Rate of Gamma Rad: 84,365,038 CPM. six hundred fifty one CPM YTD in 2018. The increase in Gamma radiation in the States this week, August 4, 2018, to August 11, 2018, was a high 69,441,100 cpm. The Rad measured YTD in 2014 was 2,459,902,345 cpm. The increase in the YTD Rad from 2014 to 2018 YTD was 31,099,306 cpm. three hundred and six cpm. “This is a Bad situation for all who breathe,” states EU physicist Dr. Paolo Scampa. Now included, for the 31st Week of 2018 just passed, all cities above 31 Million CPM  Year to Date [YTD] of deadly Gamma Radiation. Today’s 223-day or 5,352-hour report for January 1, 2018 to August 11, 2018, is another case of Bad news from your radWeather Report. 61.10% [to August 11] of 2018 is gone. 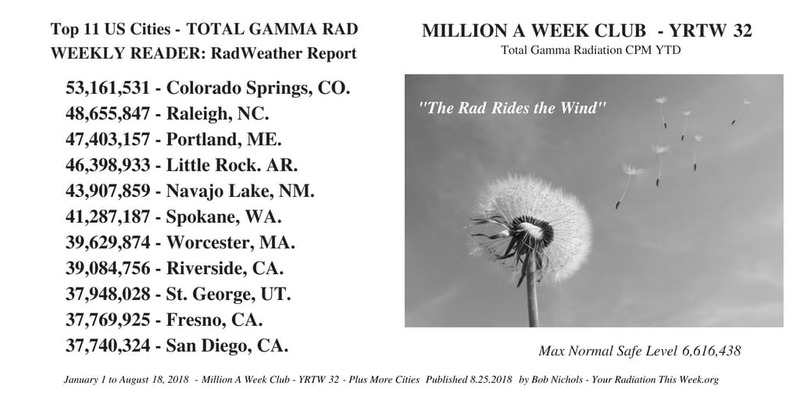 Within minutes or hours of publishing this list of cities over 31 Million YTD Counts of Radiation, four more cities will Zoom past 31 Million Counts of deadly Gamma Radiation since January 1, 2018. Cell assassins, like Plutonium 239, and its brothers were never around; they did not exist. That will be 27 cities above 31 Million Rad Counts so far this year. 2018 Annualized Rate of Gamma Rad: 84,282,321 CPM. The nearby Targeted Population of US nuclear power plants is 160,876,377 people by the official 2010 US Census with a measured 2,017,021,131 [that’s Billion] CPM YTD in 2018. The increase this week, June 23 to June 30, 2018 was a high 74,260,808 cpm. An increase in only a week that is way too high a price to pay for air conditioning or whatever. The Rad measured YTD in 2014 was 1,970,242,267 cpm. The Rad measured YTD in 2018 was 2,017,021,131 cpm. The increase in the YTD Rad from 2014 to 2018 YTD was 46,778,864 cpm, or 2.37%. “This is a Bad situation for all who breathe,” states EU physicist Dr. Paolo Scampa. 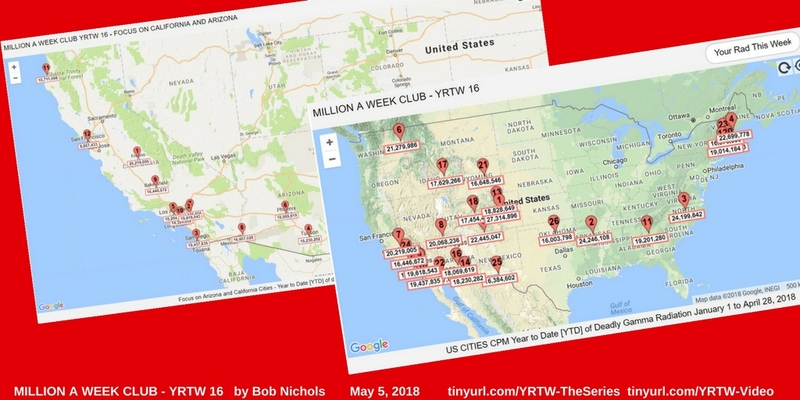 Now included, for the 25th Week of 2018 just passed, all cities above 25 Million CPM  Year to Date [YTD] of deadly Gamma Radiation. Today’s 181-day or 4,344-hour report for January 1, 2018 to June 30, 2018, is another case of Bad news from your radWeather Report. 49.59% [to June 30] of 2018 is gone. Within minutes or hours of publishing this list of cities over 25 Million YTD Counts of Radiation, four more cities will Zoom past 25 Million Counts of deadly Gamma Radiation since January 1, 2018. Killer cell assassins, like Plutonium 239, and its brothers were never around. That will be 27 cities above 25 Million Rad Counts so far this year. 2018 Annualized Rate of Increasing Gamma Rad: 84,193,899 CPM, a Rate of Increase of 12.99% over 2017.